Need a reason to jump into Ukranian with your child? With this Audiobook, learning Ukrainian has never been easier. Whether setting off on holiday to France or moving there to live, this little book explains it all to your youngsters. 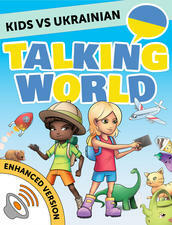 This book is for any parent that wants to get their children on the fast track to pronunciation and reading! Music video included inside! This short little book is our take on the 12 days of Christmas! Explore the mysterious rumored meaning, and Christian references used to create the 12-Days of Christmas. Need a reason to jump into Turkish with your child? With this Audiobook, learning Turkish has never been easier. Need a reason to jump into Swedish with your child? With this Audiobook, learning Swedish has never been easier. Need a reason to jump into Hungarian with your child? With this Audiobook, learning Hungarian has never been easier.